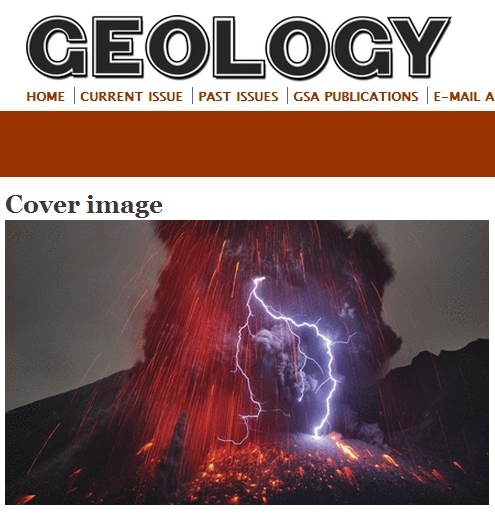 January 2014 Geology: Volcanic Lightning? | KeaNeato! A volcanic plume generates an impressive lightning bolt at Sakurajima volcano, Japan. Self-electrification of ash particles and charge distribution within the plume are controlling factors for volcanic lightning generation. See “Experimental generation of volcanic lightning” by Cimarelli et al., Geology, Jan. 2014, p. 79–82. Photo by Martin Rietze. This entry was posted in beautiful, brilliant, fascinating, Nature, science and tagged geology, lightning, photography, science, volcano. Bookmark the permalink.